Say hello to the Eleaf Invoke 220W TC Kit! Consisting of a Invoke TC Box MOD and a 2ml Ello T tank (extendable to 4ml), Invoke 220W is a compact and powerful TC Kit powered by dual 18650 batteries. Just get Eleaf Invoke Kit to enjoy superior vaping! Designed for cloud chasers, Invoke 220W TC Kit by Eleaf is a powerful and high performance vaping device powered by dual 18650 batteries. Eleaf Invoke Kit is composed of a 220W Invoke TC Box MOD and a 2ml Ello T tank (extendable to 4ml). The Invoke MOD supports a maximum output of 220W with advanced temperature control function, easy operation button and 1.3-inch large screen. With the centered 510 connection, Invoke Box MOD is compatible with most 510 atomizers. While the Ello T tank is a updated version from Ello family with easy top refilling and precise adjustable bottom airflow. What’s more, with the invovative HW coils, Invoke brings for intense flavor and huge cloud for vapers. • No cell included. You need buy dual 18650 batteries separately. • You also can buy the Invoke 220W MOD, Ello T Tank and HW1/HW2/HW3/HW4 coils in BuyBest. Именно таким образом компания реализует увеличение объема бака, а не как большинство- установкой «пузатого» стекла.Удобно ли это? если постоянно гонять с увеличенным стеклом, то по- сути да, один раз установили удлинитель и все, смысл- не вижу, на ум приходит только одно, не всем нравятся пузатые стекла. See more 220W Eleaf Invoke Kit review. Definitely the smallest dual 18650 mod I own. 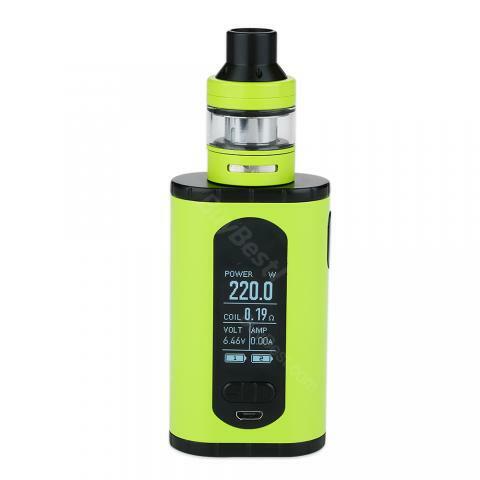 If you’re the type of vaper that needs a dual 18650 mod in your life but you want something that’s small and easy to carry around, then you have to buy this kit. A five star vape kit for sure! I'm satisfied with this Invoke kit, I don't think I'll use my old vape any more. Thumbs up!!! To be honest, I was not a big fan of Eleaf, but this Invoke kit did impress me a lot. Very well made and cheap price. This is a nice vape kit from Eleaf. Very elegant design, high quality product.